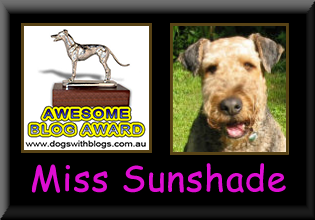 Life of Miss Sunshade - The Vancouver SuperDALE: I'm FEARLESS!! I am fearless, I am courageous ............. as long as you are not an orangy, bell shaped looking thing! Mum brought this VERY scaaaa-wie thing home yesterday, and they ganged up on me, can you believe it?? The way this thing smelled, the way it looked, very horrifying to say the least. However, mum did finally decide to side with me and felt the scaaawie thing needed to be reprimanded for scaring me (wasn't she part of the conspiracy??) . So she chopped it up good and cooked it..... (see you don't want to make my mum mad..) !! What I don't understand is, how can something so scaaaawie be so yummy?? your mom is the mastermind behind the conspiracy!!! you should not eat it to let her know you protest being the victim of her conspiracy!!! btw, YES I'M BACK! finally get to be online! hehehe. btw, have you found out what actually is that scaaawie thing? i ask mom, she doensn't know too. What was that scary thing??? Let me guess.. Was that a papaya? Wow that squash was relentless! It deserved a good eating! Ewww!!!! It cooked scarey even cooked! Kind of like my throw up. What in the world was it? But you ate it up like it was yummy so maybe it was better than it looked? You have a very impressive bark, SunShade- very deep and menacing. I need to work on mine. I love your Mom's voice- she sounds very young and sweet- the voice of an angel! Sunshade my sweet! I've been trying to post to you for a day or two. Stupid computer wouldn't work. Anyway, I am glad you are safe and sorry your mom got hurt. While it hurt your dignity and I'm sure you could have taken the rottie, I'd like you to wait until I can come and take the rottie out with you. My mom scooped me up once, but I was just a baby. Isn't amazing what these humans will do for us? My mom once got in the middle of a dog who was trying to kill me. I got hurt real bad, not that it hurt at all. But mom got in there anyway and I accidently bit her pinky fingertip off. I didn't mean to and she wan't mad. But I was so upset I couldn't even look at her for an hour. It is all healed up now and she didnt' need any plastic surgery. But you know how much I love my mom, I was just trying to defeat the evil Heidi. I guess you showed that squash how you felt about it! Say, what's that cool tube thing? That looks like fun. I agree that those squashes can be very scawwie, but you showed him! That might make a good doggie horror movie for Halloweenie! I bet all the other squashes in town are shaking in their skins! That there squash must look scaawie to you cause you still in shock from the dog attack! Mama hates squash, except for zuchinni so we have never been able to even taste it. We like that cool tunnel thingy you have there, is it fun?? the thing about those butternut squash is that they must always be hounded into submission. When I was a baby, I pulled one from the kitchen and gave it a good gnawing. We haven't had trouble from them since and so the other dogs haven't had to face off with one like you did. Did you at least eat some of the mush the squash became?? Mama eats that stuff do. And they say dogs will eat anything. Sunshade....I wanna be in the christmas card exchange but, Mama can't post on the link?? Hey Sunshade, That scaaaa-wie thing looks yummy from the way you lick your bowl clean. Are those stuff toy doggies in your room? Your room looks real fun. What?? You have your own ROOM? Well, that's probably not surprising for a starlet like yourself. Was the squash better tasting after it was scared out of it's skin by you? Boo: I think mum said the scaaaawie thing is called a butternut squash..... The name sounds ok, but it certainly is a lot more scaaaawier in real life..
Jay:pretty close, it's a squash. I don't think you guys have it over there. I don't remember seeing any in tw when I was there visiting. Boo:yeah the squash and its accomplice both deserves a good eating!! Isabella: hehe...I know the mushed up squash looks pretty disgusting LOL. Because the EVIL accomplice doens't know how to cook, so she just steamed it and mashed it up... I don't know about the EVIL accomplice sounding like an.....angel tho..
Charlie:hey DOG, that's an IKEA tunnel from the kids' section. I love it because I can run in and out of it when I play the keep-away game with mum!! Roo:Do you know anyone that's casting?? I could please the role to perfecting since it wouldn't even be acting LOL.... I am REALLY afraid of it..
Pippin:You mean you don't have those scaaawie things bothering you anymore?? I dont' know if I'm as brave as you... I mean, that wasn't the first time I'd seen a butternut squash..
Chelsea:I really like to eat that stuff, but it must be dead..... I'm gonna leave a msg on yoru blog about the X-mas Card exchange. T-man:you think I looked fierce?? That's acutally my chicken bark..... You haven't seen me REAL mad yet hehe! You liked my living room? My neighbour's kid came to my house one day, and the first thing that came out of his mouth was "COOL, it's like a dog house!!" Fufu:yes...those are my stuffies for loving, if you know what I mean! Zach:oh yes, the scaaawie thing was very yummy after "it was scared out of it's skin by me"..hehe, you made me sound so brave! !